Simmering public anger and sporadic violence intensified following Bouazizi's death, leading to the then-president of Tunisia, Zine El Abidine Ben Ali to step down on 14 January 2011, after 23 years in power. 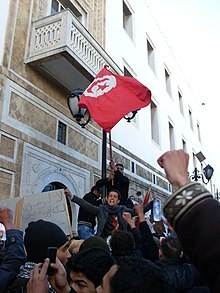 The success of the Tunisian protests inspired protests in several other Arab countries, plus several non-Arab countries. The protests included several men who emulated Bouazizi's act of self-immolation, in an attempt to bring an end to their own autocratic governments. Those men and Bouazizi were hailed by Arab commentators as "heroic martyrs of a new Middle Eastern revolution". In 2011, Bouazizi was posthumously awarded the Sakharov Prize jointly along with four others for his and their contributions to "historic changes in the Arab world". The Tunisian government honored him with a postage stamp. The Times of the United Kingdom named Bouazizi as "Person of 2011", The Jerusalem Post's Amotz Asa-El named him "Person of the Jewish Year 5771" and "The Protester" was named Time 2011 Person of the Year. Mohamed Bouazizi, who was known locally as "Basboosa", was born in Sidi Bouzid, Tunisia, on 29 March 1984. His father, a construction worker in Libya, died of a heart attack when Bouazizi was three, and his mother married Bouazizi's uncle some time later. Along with his six siblings, Bouazizi was educated in a one-room country school in Sidi Salah, a small village 19 kilometres (12 mi) from Sidi Bouzid. Although several media outlets reported that Bouazizi had a university degree, his sister, Samia Bouazizi, stated that he had never graduated from high school, but that it was something he had wanted for both himself and his sisters. With his uncle in poor health and unable to work regularly, Bouazizi had worked various jobs since he was ten, and in his late teens he quit school in order to work full-time. Bouazizi lived in a modest stucco home, a 20-minute walk from the center of Sidi Bouzid, a rural town in Tunisia burdened by corruption and suffering an unemployment rate estimated at 30%. According to his mother, he applied to join the army, but was refused, and several subsequent job applications also resulted in rejection. He supported his mother, uncle, and younger siblings, including paying for one of his sisters to attend university, by earning approximately US$140 per month selling produce on the street in Sidi Bouzid. He was also working toward the goal of buying or renting a pickup truck for his work. A close friend of Bouazizi said he "was a very well-known and popular man who would give free fruit and vegetables to very poor families". Faida Hamdi and her brother claimed in interviews that she did not slap Bouazizi or otherwise mistreat him. An unnamed eyewitness referred to by Asharq Al-Awsat claimed not to have seen Hamdi slap Bouazizi. Both Bouazizi's mother and the eyewitness who spoke with Asharq Al-Awsat stated that Hamdi's aides had kicked and beaten him after confiscating his fruit cart. Faida Hamdi states it might have happened, and Asharq Al-Awsat denies it did. Bouazizi, angered by the confrontation, went to the governor's office to complain and to ask for his scales back. The governor refused to see or listen to him, even after Bouazizi was quoted as saying, "If you don't see me, I'll burn myself." Bouazizi then acquired a can of gasoline from a nearby gas station and returned to the governor's office. While standing in the middle of traffic, he shouted, "How do you expect me to make a living?" He then doused himself with the fuel, and set himself alight with a match at 11:30 a.m. local time, less than an hour after the altercation. According to Bouazizi's sister, whose information was based on details relayed from her uncle who was present at the scene, people immediately panicked when he caught fire, and one of them tried to douse him with water, which only worsened his condition. Bouazizi had suffered burns on over 90% of his body before locals managed to stop the flames. He was taken by ambulance to a hospital, where he was placed an intensive care unit. He was subsequently transferred to a second, larger hospital in Sfax, more than 110 kilometres (68 mi) away, and then to the Ben Arous Burn and Trauma Centre in the capital, 270 kilometres (170 mi) away. On 31 December 2010, doctors reported that Bouazizi was in stable condition, and that he was showing a positive possibility of recovery. Despite the optimistic prognosis, however, Bouazizi remained comatose until his death.) Bouazizi was visited in the hospital by then-President Zine El Abidine Ben Ali. According to Bouazizi's mother, Ben Ali promised to send him to France for medical treatment, but no such transfer ever occurred, prompting Menobia Bouazizi to criticize him for his unfulfilled promises. Bouazizi died on 4 January 2011, at 5:30 p.m. local time. It is estimated that more than 5,000 people participated in the funeral procession that began in Sidi Bouzid and continued through to Bouazizi's native village, though police did not allow the procession to pass near the spot at which Bouazizi had burned himself. From the crowd, many were heard chanting "Farewell, Mohamed, we will avenge you. We weep for you today. We will make those who caused your death weep." He was buried at Garaat Bennour cemetery, 15 kilometres (10 mi) from Sidi Bouzid. His grave was described by Al-Jazeera as "simple" and surrounded by cacti, olive, and almond trees. In addition, a Tunisian flag flies next to the site. Tom Chesshyre also describes his tomb after visiting it: small, white, by a row of cacti, and with a simple inscription: "Martyr Mohamed Bouazizi. Peace for his life. And in the next life, have peace as well". An investigation was launched following Bouazizi's self-immolation to find the details leading up to his actions. On 20 December 2010, it was reported that Faida Hamdi, the officer who allegedly accosted Bouazizi the day of his immolation, was suspended along with the secretary-general (governor) of Sidi Bouzid, but this was subsequently denied by the latter. Some time later, Hamdi was arrested on orders from President Ben Ali and held in an unspecified town. A brother of Hamdi later stated that she had been arrested and detained twice, the first time following Ben Ali's visit to Bouazizi in the hospital and subsequent meeting with his mother and sister at his presidential palace. He says his sister and her aides were released following a short detention and the closing of the investigation which "confirmed her innocence." He said her second arrest was "in response to the demands of the Tunisian protesters," and that the Tunisian security authorities informed him that she was being held only for her own protection and would be released once the protesting ended. According to Bouazizi's mother, Bouazizi chose to take this action because he had been humiliated, not because of the family's poverty. "It got to him deep inside, it hurt his pride," she said, referring to the police harassment. One of Bouazizi's sisters stated during an interview with Asharq Al-Awsat that their family intends to take legal action against all involved, "whether this is the municipal officers that slapped and insulted him, or the mayor [who] refused to meet him." On 19 April, the case against Hamdi was dropped after Bouazizi's mother withdrew the family's complaint against her. She stated "It was a difficult but well-thought-out decision to avoid hatred and... [to] help reconcile the residents of Sidi Bouzid." Hamdi had maintained her innocence, telling the court she did not slap Bouazizi, while her lawyer said the matter was "purely a political affair." Bouazizi's brother Salem supported the decision, saying "All the money in the world can't replace the loss of Mohamed who sacrificed himself for freedom and for dignity." Large crowds of people outside the courtroom also appeared to have been satisfied by the Bouazizi family's decision with some claiming Hamdi was being used as a scapegoat. Since suicide is forbidden in Islam, Bouazizi's self-immolation created controversy among scholarly Muslim circles. While Al-Azhar University, the most prestigious religious institution in the Sunni Muslim world, issued a fatwa ("directive") stating "suicide violates Islam even when it is carried out as a social or political protest," influential Egyptian cleric Yusuf al-Qaradawi spoke sympathetically of Bouazizi. On 4 February 2011, Bertrand Delanoë, the mayor of Paris, announced that, as a tribute to honour Bouazizi, a square in Paris will be named after him; the Place Mohamed-Bouazizi [fr] was unveiled four days later. On 17 February, the main square in Tunis that was previously called "November 7", after the date of Ben Ali's take-over in 1987, was renamed "January 14," though some had suggested it should honor Bouazizi (though a major roadway leading to the city's airport was renamed for him). Bouazizi was posthumously awarded the 2011 Sakharov Prize as one of "five representatives of the Arab people, in recognition and support of their drive for freedom and human rights". On 17 December, a cart statue was unveiled in Sidi Bouzid in honor of Bouazizi. Tunisia's first elected president Moncef Marzouki attended the ceremony, stating "Thank you to this land, which has been marginalised for centuries, for bringing dignity to the entire Tunisian people." Also, in Sidi Bouzid, as well as in the capital city of Tunis, both cities' respective main streets were renamed, "Boulevard Mohamed Bouazizi". The United Kingdom's The Times newspaper named Bouazizi person of the year for 2011. "By Fire," a story by Moroccan author Tahar Ben Jelloun inspired by this incident, was published in The New Yorker edition of 16 September 2013. A fictional treatment, some details in the story differ from the factual account. An interview with the author about his story was posted to The New Yorker's "This Week in Fiction" on 9 September 2013. On 17 December 2015, the Tunisian National Dialogue Quartet, the Nobel Peace Prize laureates of that year, as well as other civil society organizations, celebrated Mohamed Bouazizi and the start of the Arab spring five years after his death in a ceremony in Sidi Bouzid. There are many perceptions on who Mohamed Bouazizi was. After his self-immolation, Bouazizi's image flooded social media which lead to worldwide discourse. This complicated how Bouazizi was seen, "Mohamed Bouazizi is not our hero. He's your hero," said local Nader Ncibi. There are accusations that social media diluted what Bouazizi stood for. Naafil Harshani, an activist that grew up with Bouazizi, said, "what was important to Mohamed was putting food on the table and football. He had nothing to do with politics and wanted nothing to do with politics." Mohamed Bouazizi did not plan to start a revolution, but it is undeniable that it preceded his anger towards not being able to sell his fruit. "There are many stories on who Mohamed was and who Mohamed wasn't," said Zahra Shwabli, a Hay Al Noor primary school teacher, "It is important for us on this day to remember what Mohamed Bouazizi stood for: the dignity of all Tunisians. And that is something that not even time can take away from us." Bouazizi's actions triggered the Werther effect, causing a number of self-immolations in protests emulating Bouazizi's in several other countries in the Greater Middle East and Europe. In Algeria in particular, protests against rising food prices and spreading unemployment have resulted in many self-immolations. The first reported case following Bouazizi's death was that of Mohsen Bouterfif, a 37-year-old father of two, who set himself on fire when the mayor of Boukhadra (in Tébessa Province) refused to meet with him and others regarding employment and housing requests on 13 January 2011. According to a report in El-Watan, the mayor challenged him, saying if he had courage he would immolate himself by fire as Bouazizi had done. He died on 24 January. In nearby El Oued Province, Maamir Lotfi, a 36-year-old unemployed father of six, also denied a meeting with the governor, burned himself in front of the town hall of El Oued on 17 January, dying on 12 February. Abdelhafid Boudechicha, a 29-year-old day laborer who lived with his parents and five siblings, burned himself in Medjana on 28 January over employment and housing issues. He died the following day. In Egypt, Abdou Abdel-Moneim Jaafar, a 49-year-old restaurant owner, set himself alight in front of the Egyptian Parliament. His act of protest helped instigate weeks of protest and, later, the resignation of Egyptian President Hosni Mubarak on 11 February 2011. In Saudi Arabia, an unidentified 65-year-old man died on 21 January 2011, after setting himself on fire in the town of Samtah, Jizan. This was apparently the kingdom's first known case of self-immolation. The wave of copycat incidents reached Europe on 11 February 2011, in a case very similar to Bouazizi's. Noureddine Adnane, a 27-year-old Moroccan street vendor, set himself on fire in Palermo, Sicily, in protest of the confiscation of his wares and the harassment that was allegedly inflicted on him by municipal officials. He died five days later. In Amsterdam, Kambiz Roustay, a 36-year-old asylum seeker from Iran, set himself on fire on Dam Square in protest of being rejected asylum. Roustay had fled the country for publishing works undermining the regime, and feared being tortured by the Iranian government upon his return. ^ a b c d e f g Fahim, Kareem (21 January 2011). "Slap to a Man's Pride Set Off Tumult in Tunisia". New York Times. p. 2. Retrieved 23 January 2011. ^ "Sakharov Prize for Freedom of Thought 2011". European Parliament. Archived from the original on 23 October 2011. Retrieved 27 October 2011. ^ "New Stamps Issued by Tunisian Government". Connection.ebscohost.com. Retrieved 2 April 2012. ^ a b c d e f "Tunisia: 'I have lost my son, but I am proud of what he did'". The Independent. UK. 21 January 2011. Retrieved 23 January 2011. ^ a b c d e f Beaumont, Peter (20 January 2011). "Mohammed Bouazizi: the dutiful son whose death changed Tunisia's fate". The Guardian. UK. Retrieved 23 January 2011. ^ a b c d e f g h i j k l m Ryan, Yasmine (16 January 2011). "The tragic life of a street vendor". Al Jazeera English. Retrieved 23 January 2011. ^ a b c d e f g h i j k Abouzeid, Rania (21 January 2011). "Bouazizi: The Man Who Set Himself and Tunisia on Fire". Time. Retrieved 23 January 2011. ^ Kherigi, Intissar (19 January 2011). "Tunisia needs real freedom". The Guardian. UK. Retrieved 26 January 2011. ^ Toumi, Habib (31 December 2010). "Man at the centre of Tunisia unrest recuperating, doctors say". HabibToumi.com. Archived from the original on 12 October 2017. Retrieved 23 January 2011. ^ a b c d e f Al-Saleh, Huda (2 February 2011). "Controversy over "the slap" that brought down a government". aawsat.com. Archived from the original on 26 February 2011. Retrieved 15 February 2011. ^ a b Michael J. Totten (17 May 2012). "The Woman Who Blew Up the Arab World". World Affairs Journal. Retrieved 17 May 2012. Barack Obama mentioned me in a speech. He said I was a cop. He said I slapped Mohamed Bouazizi. He's a stupid fool for not checking. Americans are great people, but you need to do a better job of checking your information. ^ "The Arabs by Eugene Rogan". Arabsahistory.com. Archived from the original on 23 March 2012. Retrieved 18 June 2011. ^ "President Zine el Abidine Ben Ali visits young man Mohamed Bouazizi". Tunisia-tour.com. Archived from the original on 31 December 2010. Retrieved 23 January 2011. ^ Ben Bouazza, Bouazza (5 January 2011). "Youth at heart of Tunisia unrest buried". WTOP-FM. Archived from the original on 19 March 2015. Retrieved 23 January 2011. ^ "A Tunisian flag flies next to grave". Yahoo! News. 11 March 2011. Archived from the original on 4 November 2012. Retrieved 25 April 2011. ^ "A Tourist in the Arab Spring". Bradt Travel Guides. 2013. ^ "Tunisia suspends four over attempted suicide". Radio Netherlands Worldwide. 28 December 2010. Archived from the original on 28 September 2012. Retrieved 23 January 2011. ^ "Tunisia: Sidi Bouzid; Municipal Secretary Not Suspended". Ansa Mediterranean. 28 December 2010. Archived from the original on 28 September 2011. Retrieved 23 January 2011. ^ "Tunisia revolt: Mohamed Bouazizi police suspect freed". BBC News. 19 April 2011. Retrieved 20 April 2011. ^ Day, Elizabeth (23 April 2011). "Tunisia (News), Arab and Middle East unrest (News), Middle East (News), Zine al-Abidine Ben Ali (News), World news, Africa (News)". The Guardian. London. ^ a b Jansen, Michael (1 February 2011). "Ben Ammar to produce film on Tunisian hero Bouazizi". Arab News. Al-Sharq al-Awsat. Archived from the original on 1 February 2011. Retrieved 11 April 2011. ^ a b Watson, Ivan (22 March 2011). "The Tunisian fruit seller who kickstarted Arab uprising". Cable News Network. Archived from the original on 8 April 2011. Retrieved 11 April 2011. ^ Sadiki, Larbi (29 December 2011). "The Bouazizi 'big bang'". Al Jazeera English. Retrieved 28 July 2012. ^ Agence France-Presse (4 February 2011). "Delanoë veut donner le nom du jeune Tunisien immolé à un lieu parisien (French)". Google News. Archived from the original on 31 July 2012. Retrieved 5 February 2011. ^ "Tunisia unveils Bouazizi cart statue in Sidi Bouzid". BBC News. 17 December 2011. Retrieved 28 July 2012. ^ "UK's Times newspaper names Bouazizi person of 2011". Al Arabiya. 28 December 2011. Retrieved 28 July 2012. ^ Deborah Treisman (6 September 2013). "This Week In Fiction: Tahar ben Jelloun". The New Yorker. ^ Jensen, Jon. "The making of a martyr: truth or legend? – Some doubt the story of Mohamed Bouazizi whose suicide sparked the revolution in Tunisia." GlobalPost: Beats (North America) 16 May 2011, Regions. NewsBank. Web. 26 October 2016. ^ a b "One year on, Tunisia celebrates man behind 'Jasmine Revolution'." Jordan Times, The (Amman, Jordan) 18 December 2011, NEWS. NewsBank. Web. 26 October 2016. ^ Benslimane, Mehdi & Slim Badaoui (24 January 2011). "Le maire à Mohcin Bouterfif : " Si tu as du courage, fais comme Bouazizi, immole-toi par le feu "" (in French). DNA-Algerie. Archived from the original on 28 January 2011. Retrieved 22 February 2011. ^ A.B. (29 January 2011). "Un jeune décède après s'être immolé par le feu à Bordj Bou Arréridj". El Watan (in French). Archived from the original on 1 February 2011. Retrieved 22 February 2011. ^ a b c "BBC News – Tunisia one year on: New trend of self-immolations". Bbc.co.uk. 12 January 2012. Retrieved 23 June 2012. ^ Mifthah, Mohideen (22 January 2011). "Man dies in possible first self-immolation in Saudi". The Sunday Times. UK. Archived from the original on 25 January 2011. Retrieved 23 January 2011. ^ "Street Vendor Sets Himself on Fire in Palermo, Critical". Agenzia Giornalistica Italia. 12 February 2011. Archived from the original on 29 June 2011. Retrieved 22 February 2011. ^ "Palermo, Moroccan street vendor dies after setting himself on fire". Ahora Italia. Archived from the original on 7 July 2011. Retrieved 22 February 2011. Wikimedia Commons has media related to Mohamed Bouazizi. This page was last edited on 19 April 2019, at 19:19 (UTC).